This is a work of believable fantasy. It is not a fantasy of this world but a fantasy land in an invented world whose currency is high myth, legend and history as we might recognise it. The Epic at the End of the World covers the very beginning of that world and goes onto the last of it. 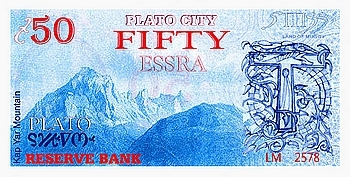 Illustrated below is the 50 Essra banknote. 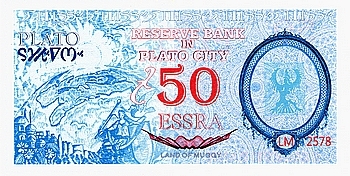 The issuing authority is the Reserve bank in Plato City. These are now available for collectors. Further denominations will follow. I have tried to assemble the maps to follow the naivety of the Wilderfolk. However, the need to show the real-map is not ignored. Apart from this, the maps presented keep the feel of the Age- but with very little explanation to guide the reader. This is because they are taken from my notes. They were never intended to be maps- in the true sense. However, to satisfy those interested in the maps of Muggy, the assembly of The Atlas of Muggy should be an eagerly awaited edition. The very earliest maps are from the library at Paradia established after the events of this story. Some of these maps are ancient but the majority of them are drawn from Voyagers or recounted memories. Others are creations based on fanciful tales and notions. Another great library for maps existed at Mayhav; but in time these places declined and they were lost. Many found their way into the scroll collections of the White Shield. Again, these were added to- or distorted deliberately, but they glimpse the earlier notion of this world. This is wide in its scope and therefore not necessarily detailed in the way a novel would be; it is really the history but is hopefully somewhat more interesting than 'just history'. It is well short of what is possible if one devoted time and study of a whole life time; it is necessary and it would be thoughtful as well, to give the reader a feel for its overall structure before being confronted with the whole. So I have attempted a construction that might heighten the desire in the reader who has been willing to at least pick it up and have a go at it. I believe that it is long overdue that such a work as this comes into print because there have been precious few such invented worlds as vast as Muggy; with myths, legends, history, maps and stories. I had always believed that any attempt to put together such a large work as this; that 'putting it all together' was imaginatively out of this world and would be doomed to failure; but here it is despite its size. Before Salger In the Land of Muggy, the problems of a Calendar are difficult. There was no moon. The length of a day is sketchy being conveyed by the term Middle of the Day; or Middle of the Night; and less importantly- near the middle of the afternoon. There was the high sun tide in the Middle of the Day that ebbed to its lowest at the Middle of the Night. There was the Sar, a moon-planet- we do not know for sure. It was predicted to arrive again in 96 generations but in these times, they did not know how to calculate that. The Calendar in the time of Salger was in chaos and dispute. It had become a tradition and the Lectar Chronicle preserved this legend from year to year. The Dark Year and the Light Year were largely out of favour but the state held on to this calendar because it suited their festivals, treasury and labour requirements. Salger was an astronomer- a StarGazer and a scholar of the Temple Stories. He made his 'Letter of Days and Nights' based on the stars Zodia and Hirmer. There was a body of knowledge at the time on such matters- and Salger was able to prove it. Following is the origins of the calendar in the Southing and the other calendars adopted later- the Red Robes Calendar and the Plato Calendar. All except the Lectar Chronicle were built upon the observations of Salger.